Will My Path and Injury Prevent Me From Med School? Our poster today is wondering about their journey and whether it’s too long and too unusual that it may hurt their chances of getting into medical school. Questions tackled here are taken directly from the Nontrad Premed Forum, where you can register for free and post if you have any questions. Moreover, check out all our other podcast on MedEd Media Network to help you along this path to becoming a physician. The Premed Years Podcast features general premed advice and discussions with admissions committee members as well as deans and directors of admissions committees. We also bring in students to share with medical school application experiences. 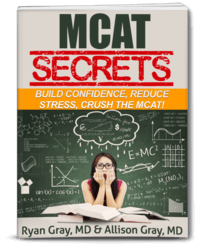 The MCAT Podcast is a collaboration with Next Step Test Prep providing you free MCAT prep help. We also have Specialty Stories where we feature physicians as they share why they chose their career, some things they like and don’t like about it, and more. Also, stay tuned for more podcasts coming – one for medical students and another one for those preparing for the MCAT. “I’ve been interested in becoming a physician, practically since I pronounced the word. As such, I worked hard in school and ultimately got accepted to a prehealth high school program. Through this program, I was able to focus my coursework towards my dream of medicine by taking classes such as Anatomy, Physiology, Medical Terminology, and Nutrition, that I was able to earn a college credit for it through an agreement between high school and a local medical school. In my Junior year, I participated in a clinical where my class would visit a dementia care facility on a weekly basis for over 20 hours total, and talk, play games, etc. with patients. I was also involved in a number of ECs including marching band, leading a girl scout troop, and holding leadership positions in various honors societies. In addition, I was a member of the local chapter of the Health Occupations Students of America (HOSA) and SkillsUSA, two student organizations that host regional and national competitions in health, science, and premed related events. Through which, I placed in both state and national competitions. The high school program culminated with taking my entire senior year course load at a community college, earning a total of 35 college credits prior to high school graduation, while participating in a 150-hour internship I completed with my own pediatrician where I shadowed and got clinical experience, taking bios, medical histories, and otherwise interacting with patients, which further motivated me toward my goal. During my senior year of high school, I sustained a traumatic brain injury that resulted in memory and learning issues that were not detrimental after I had to withdraw from two of the college courses. Despite the advice from my doctors and cognitive therapist, I was determined to be in college the following fall and not delaying my progress towards becoming my dream. This resulted in an undergraduate GPA with a progressively downward trend from Freshman to Junior year, as the classes increased in difficulty and I struggled to figure out how to learn and retain information with my new challenges. I also lost all hope of getting into medical school and turned to research as a new career option. I stayed involved in my campus where I was a resident advisor. I participated in a few clubs where I held leadership positions. By senior year of undergrad, I was finally able to find a new system of learning that worked and I was able to do well enough to get into the master’s program at my school. I completed a research project. I was back to earning all A’s, B’s, and even a few A+’s. After graduation, I took a job as an associate researcher, doing translational work with a major medical school in the area. Through my nearly years working full time in the setting, my dream of becoming a physician has now been resurrected. As I have realized that I won’t feel fulfilled without being able to interact with the patients and direct their clinical care. Having regained my self-confidence and motivation, I now feel determined to pursue medical school and ultimately become a physician and heal patients and provide inspiration for their resilience and ability to self-advocate throughout treatment. If we were to ignore everything you said about your traumatic brain injury (TBI) and just used the words “struggled in undergrad” and finally figured out how to study and your grades improved, then you had an upward trend finishing college and a good college GPA in your grad school, then all you have to do is do well on the MCAT, find schools that are going to be okay with your GPAs, and apply. Of course, you have to do shadowing and clinical experiences and doing all those other things. The twist here is your medical condition but ultimately, it doesn’t have to do with anything. But you obviously figured out how to be a good student. So the question you have to answer when you’re getting your medical licenses is: DO you have any sort of injury that is going to hinder your ability to take care of patients? Do you have significant enough cognitive deficits that there’s a question about your ability to take care of patients? You may have figured out how to do well in school, but when it comes to being sleep-deprived, not eating well, etc. – those things can exacerbate the deficits of a TBI. If you’re in medical school or in residency and you’re stressed, not sleeping well and not eating right, not exercising, are your cognitive deficits going to put patients in harm’s way? Think about a PA versus an MD. A PA or NP has to know their own limitations when treating patients. The same thing for any physician who has any sort of deficits. You have to know your own limitations when it comes to treating patients. If you have such a severe brain injury that you have severe cognitive deficits especially when you’re sleep-deprived, stressed, not eating well, and not exercising, and your decision-making skills are decreased, should you really be taking care of patients? It may be your dream to become a physician but you may have drawn the short straw with this TBI to realize that maybe putting someone’s life in your hands is not the right choice. This is the only concern here. Outside of that, you can go to medical school and be a physician as long as you do well on all those other things (shadowing, clinical experience, etc.) Take the brain injury out of it and you’re a typical college student who struggled how to figure out to learn. But then if you compound this with your TBI, think about the future and honestly answer this: are you going to be able to take care of your patients? Leave us a Review and Rating! Just like Yelp reviews or IMDB ratings help you choose your next restaurant or movie, leaving a 5 star rating and/or a written review is very valuable to the OldPreMeds Podcast. It allows us to be able to share our information with more people than ever before. I am so incredibly thankful to those who have recently gone into our listing in iTunes to provide a five start rating and a written review of the OldPreMeds Podcast. iOS/Mac/Windows – You can subscribe to the show in iTunes. Or you could manually add the RSS feed to your aggregator. If you like the show, will you please take a moment to leave a comment on iTunes? This really helps us get the word out! Can You Ever Be 100% Sure You Are on the Right Path?